"Hi Gary ' loved Lorraine's Book so did my wife. Just great! Have just finished Ironman (16hrs.07min) ( my second) in good nick. A friend wants me to do Rotorua Marathon with him early May - after 10 days will my body cope ok with training for another marathon ? I'm 58 in good condition - not perfect though - do have some calf muscle issues both with bike and early running off the bike then it gets better. Have downloaded your Training Manual (58 pages) - thanks. In essence should I take on the Rotorua Marathon ? My running time for the marathon during IM was 6 hours 18min - half of it walking. Do enjoy slow jogging 8min per k."
David, it is not a good idea to be pushing your body as hard as you are. Your age is such that running back-to-back marathons will result in irreparable joint arthritis in just a few years. We simply do not hear about the distance runners, Iron Men, etc who grind to a halt with ruined joints, muscles and suffering chronic fatigue - we are talking about health issues that can take a terrible toll on quality of life. Sadly, the popular sports magazines want you to hear of the stories of incredible physical feats and not the disasters of which there are plenty. I get to see some of these silent casualties. Sure, there are freakish individuals who are capable of super human feats - similar to the stories of the Centenarian who smoked since childhood. But these are the exceptions. 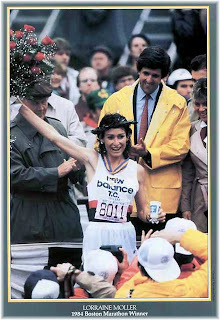 Lorraine, holds the unofficial world best for longevity as an internationally ranked running athlete. Few of those who competed against her lasted more than four or so years at or near the top. When you read her book, you will realise that she was able to take enormous punishment but eventually succummed, knowing when it was time to back off and retire - fortunately! She managed 28 years at or near the top by caring for her body, retiring with everything in perfect working order. We should learn the lessons that come from those who survive and those who fall by the way. When there is wear, such as happens during running, the human body must have sufficient rest to allow repair and growing a little stronger. The more running etc that you do, the more rest you must have between. The older you get, the longer the rest between sessions. One of the most common training faults is old men and women being given a young person's training and competition schedule by a naive fitness expert. This is a recipe for disaster, including risking permanent harm. Lorraine has some advice about recovery in this video interview. Her general rule of thumb is: One day rest for every mile run. So, if you run a marathon, you should take about a month of gradual buildup back to full training and then take another 3-4 months before doing another marathon or Iron Man. Two to three marathons per year is about all your body should be subjected to. A similar formula can be applied to cycling. I work on the basis of a day of rest for every 5-10 miles raced. Cycling is so much easier on the body compared to running the pavements. David, why not explore other forms of running? Your body thrives on variety. Get out of the grind of long, slow running. Try joining a running club and doing lots and lots of short 3-8km cross-country and road races. Go do some short course off-road triathlons and adventure runs. Team up with a friend and share the load - you do the run or the bike. This way you spare your legs while upping the intensity. Its exciting running and your occasional marathon and Iron Man will benefit because you will be fresher and faster over the longer distances.